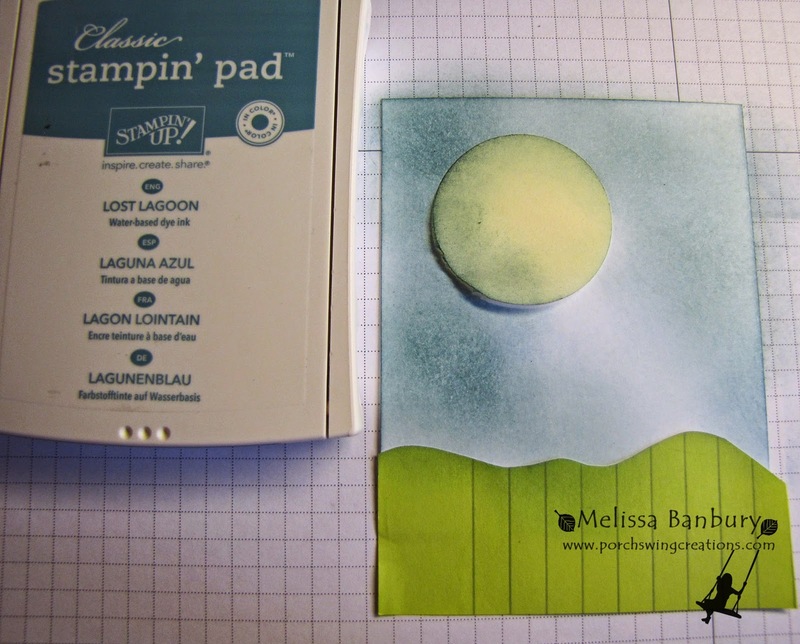 Begin with a piece of Whisper White card stock cut to desired size. 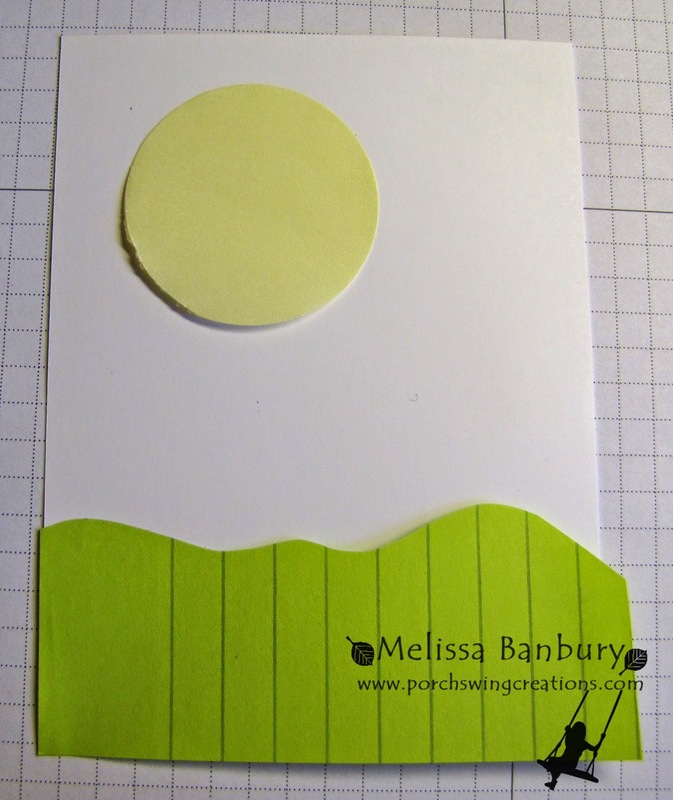 Punch a 1 3/4" circle from a post it note and place it in the upper left hand corner. 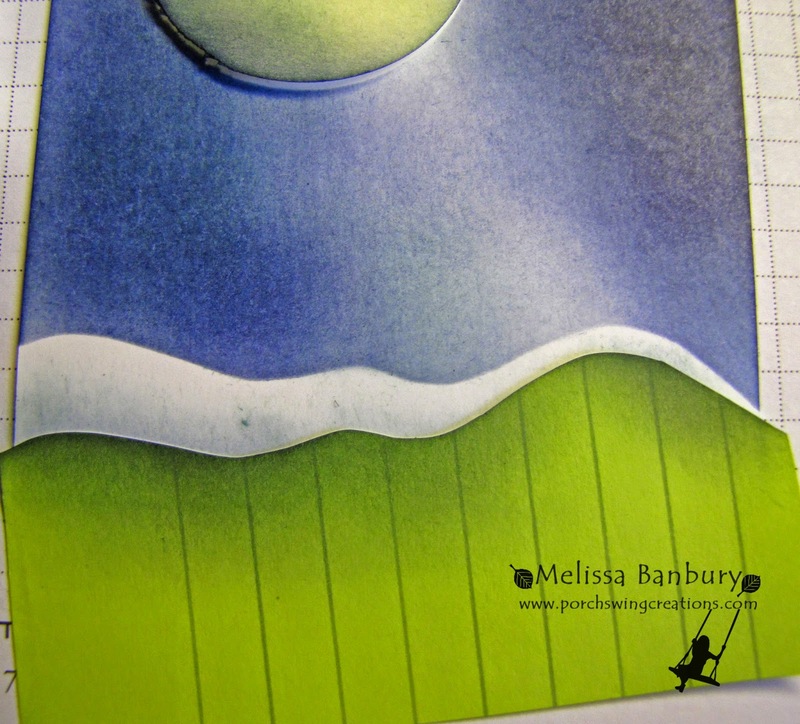 With paper snips trim a second post it note in the shape of snowbanks and place approximately 3/4 of the way down the card stock. 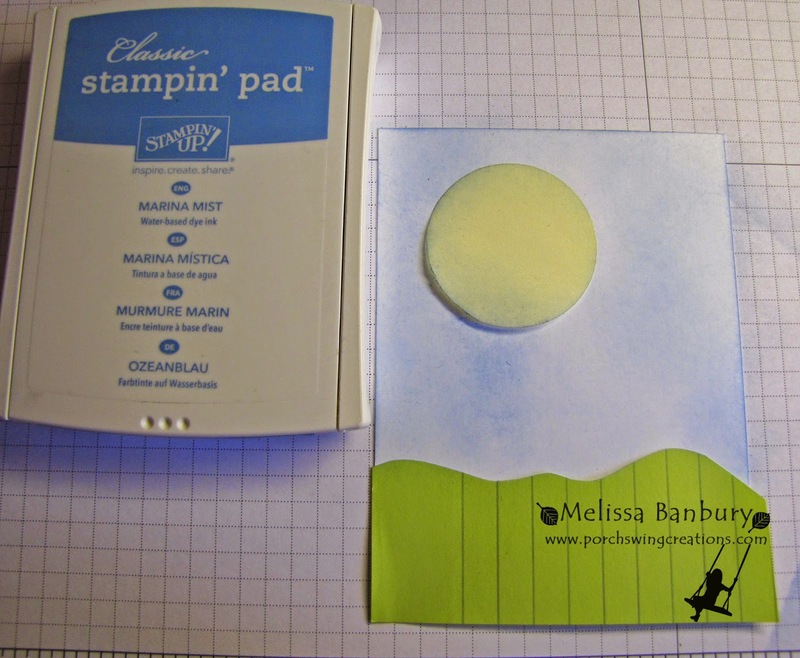 Sponge Marina Mist ink over the entire exposed area of the card stock. Sponge Lost Lagoon over the outer edges blending inward. Leave more of the Marina Mist ink showing through around the bottom right of the moon. By doing this we will begin to create a light cast. Sponge Night of Navy beginning on the outer edges, blending inward. Be mindful to leave the light cast area quite light. Remove the bottom post it note and shift it down and off angle slightly. Sponge Marina Mist in the white space; but only along the bottom portion (along the post it edge). Leaving the upper portion pure white is what will give the snowbanks shadow and depth. Continue moving the snowbank post it down and repeating the sponging steps until you have as many snowbanks as you would like. In this case I've moved the post it twice. Remove the moon mask and sponge So Saffron inside the moon area; in this case I've sponged the most intense color in the center and blended outwards to the edges. 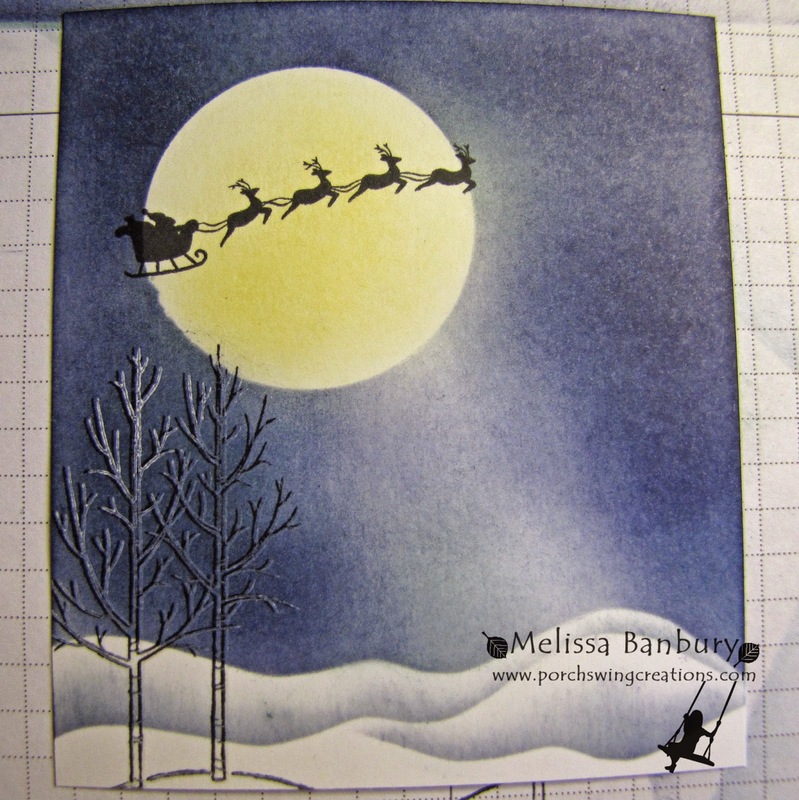 Stamp the Santa and Reindeer image from the Holiday Home set in Basic Black across the center of the moon. 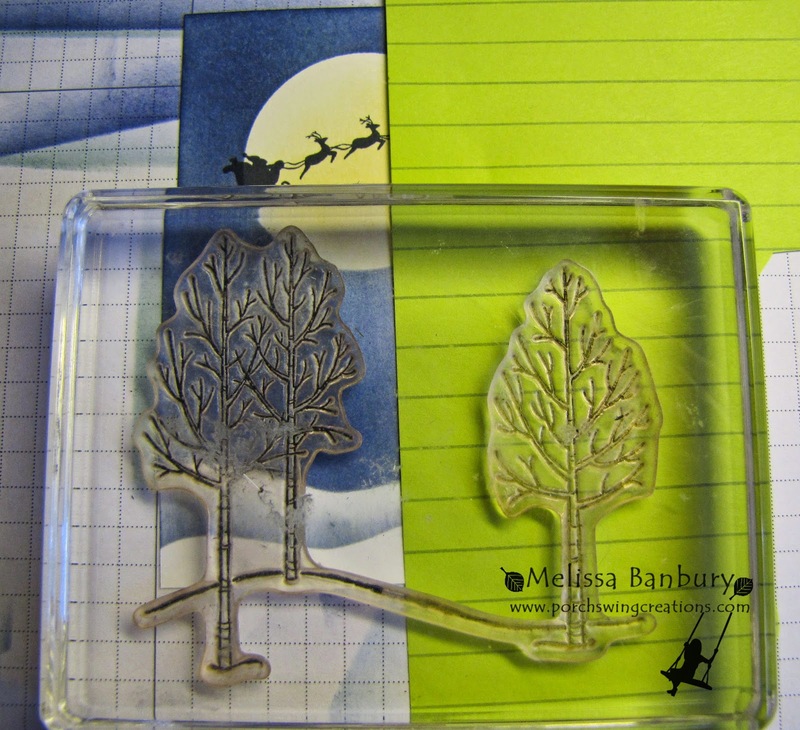 Next, mask off the right side of the scene and stamp only two of the trees from the White Christmas set in Basic Black onto the left side of the scene. 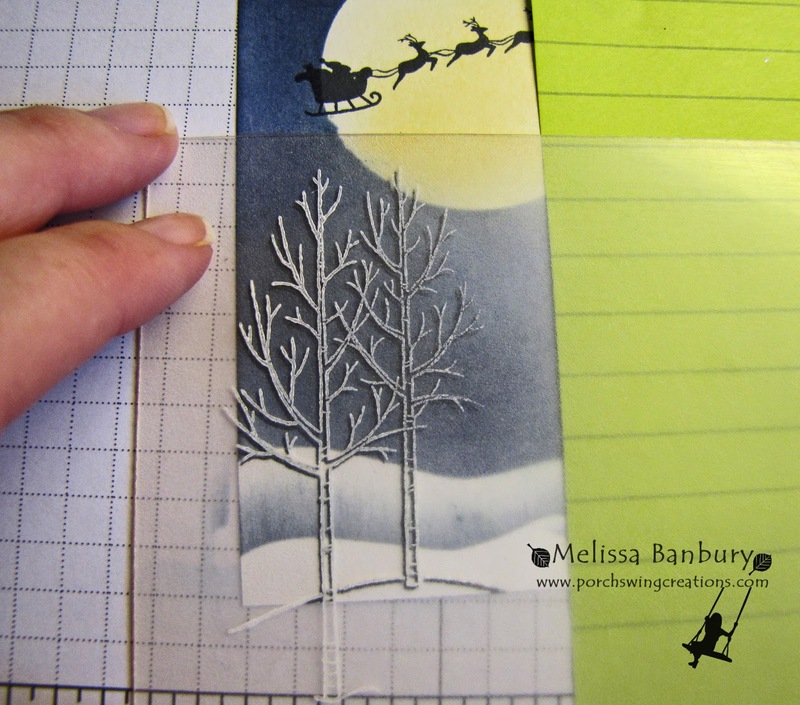 Using a Stamp-a-ma-jig as your guide, slightly offset the trees and stamp again using Whisper White Craft ink to give the look of snow on the trees. Here is a finished look at the "snow" covered trees. 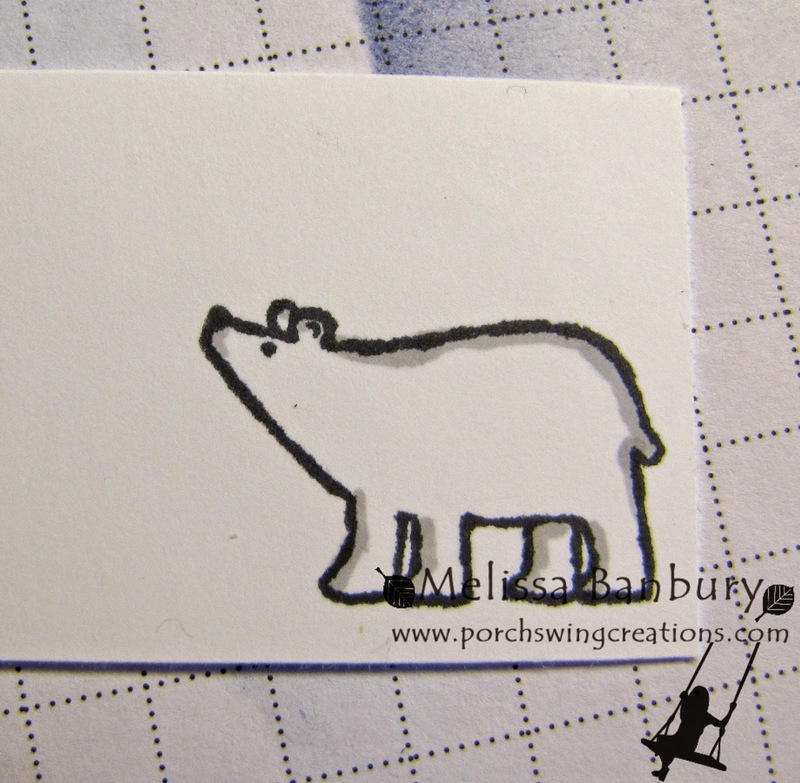 Stamp the Polar Bear from the White Christmas set onto Whisper White card stock with Tuxedo Black Momento ink. Shade the bear slightly with the lightest shade in the Smoky Slate Blendabilities. Cut out with paper snips. Adhere the bear to one of the snowbanks using Multi-purpose liquid glue. 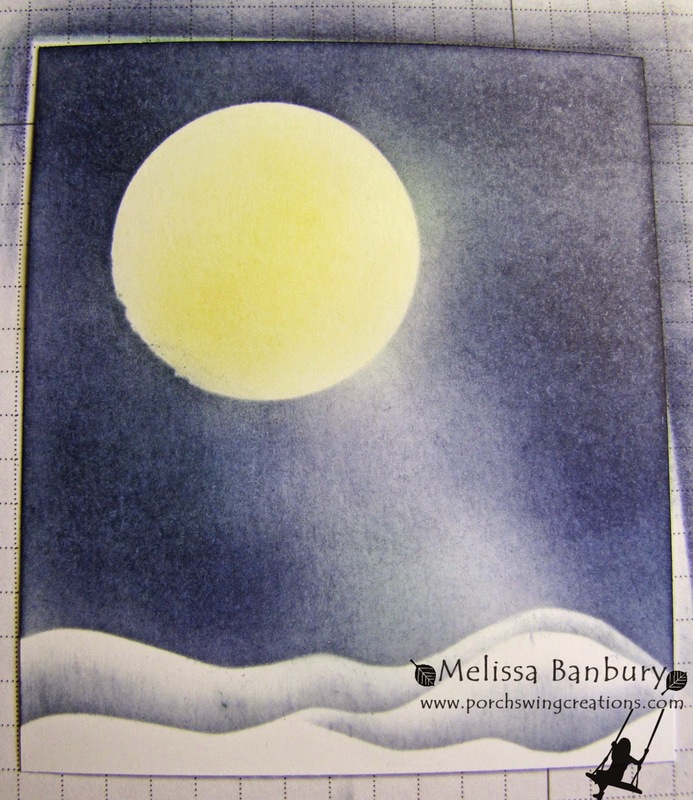 Add falling snow to the sky using both a White Stampin' Chalk marker and a White gel pen. 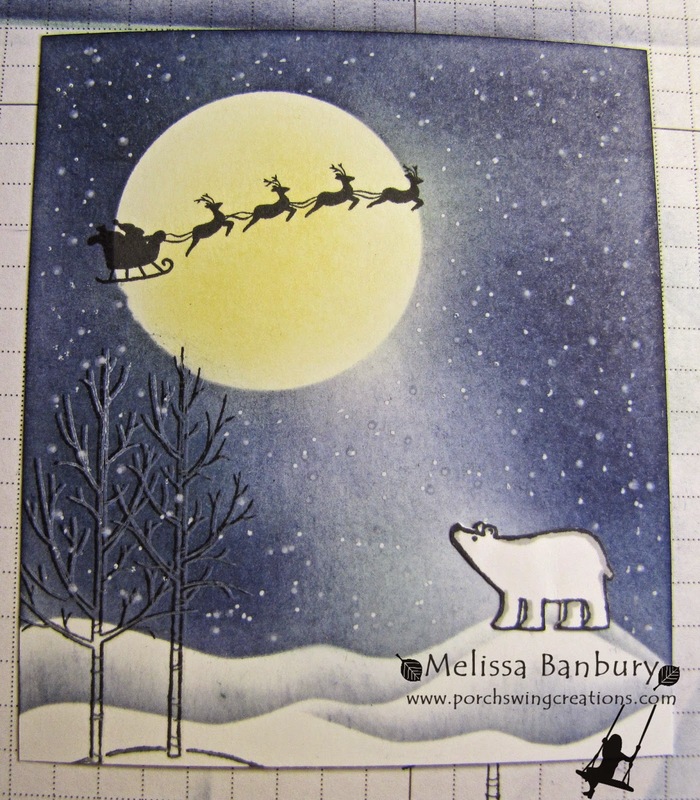 By using both pens you'll achieve the look of snow flakes close and snow flakes further back - its all the little details that will help add depth to your artwork! As a finishing touch line the tops of the snowbanks with a 2 way glue pen and add Dazzling Diamonds. 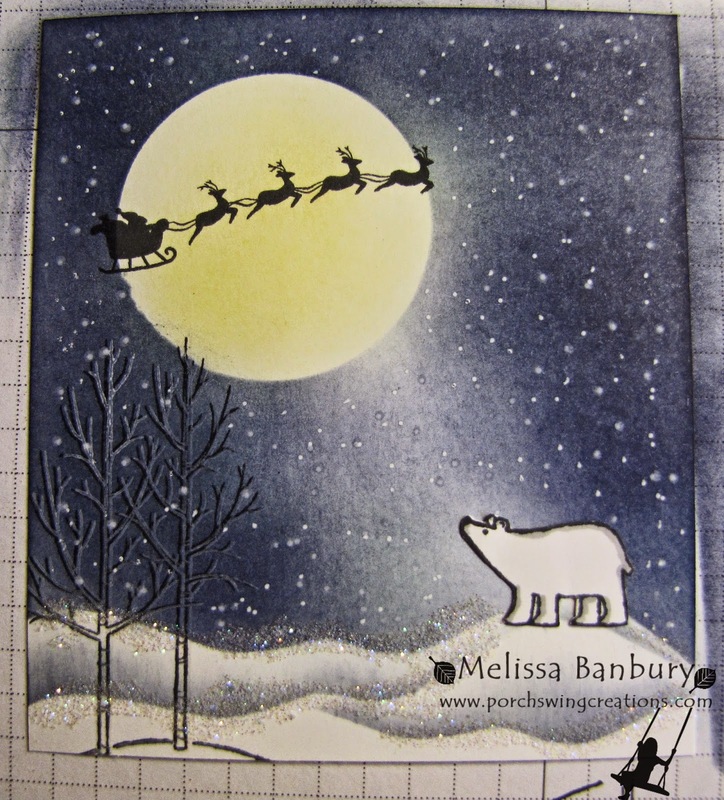 A little sparkle on a Christmas card is always a nice touch! 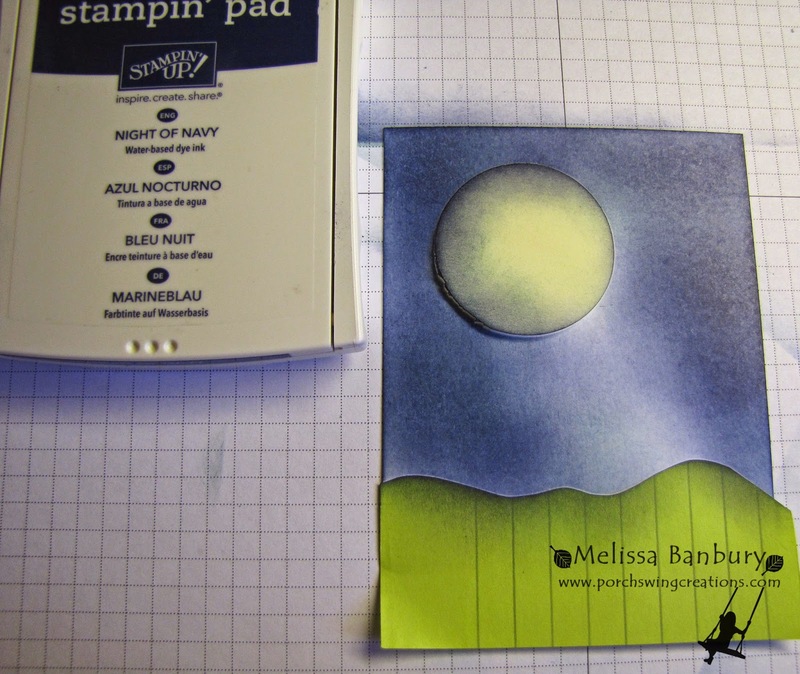 Melissa, thank you for sharing your art…..I need to challenge myself to make a few more techniques on my stamping. Your card is absolutely precious. Tx for the great tutorial. I appreciate your work. :) Blessings! Thank you for the fab tutorial. Pinned for later reference. Wonderful tutorial–I can't wait to try it! Just seeing this now…I am pinning this so I can try out these techniques next holiday season. Beautiful!